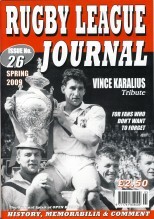 We are a quarterly magazine for fans who don’t want to forget the game they used to know, with each issue packed with features, memorabilia and wonderful old black and white photographs aimed at bringing back memories of Rugby League the way it used to be. Published and edited by Harry Edgar, founder of the former 'Open Rugby' magazine, 'Rugby League Journal' continues the pioneering spirit. If you share our desire to stand up for Rugby League and to preserve its history and traditions, you’ll love our Journal. Take a look – you’ll find details of all our back issues, how to subscribe and enjoy every issue of “Rugby League Journal” and our very popular books in the "Rugby League Journal History Series", plus our Annuals now available at reduced bargain prices. You will also find a large selection of DVDs which will allow you to see some of the greatest moments in Rugby League history come to life.